When it came to decorating our apartment - it's always been a joint venture. Gary and I both have to agree on whatever is that's going to be in our place. So when time came to pick our first piece of art, the same was true. Well this task proved to be a lot easier said than done, turns out that while we have similar styles, there is a lot more that goes into choosing a piece! We took to Minted's Art section and were able to sort by style which thankfully we easily narrowed down to abstract. We then went through and started sorting by color trying to figure out which pieces would fit best above our desk area. Ultimately we ended up with a piece that was a little darker, but had some pretty colors to add some more dimension to our room. The easiest part was actually picking the frame - which I was so happy to find that Minted did for you. You pick from 11 different frame styles and we ended up with a darker distressed wood. The Indes piece came and it was beyond beautiful! I was in love with it! 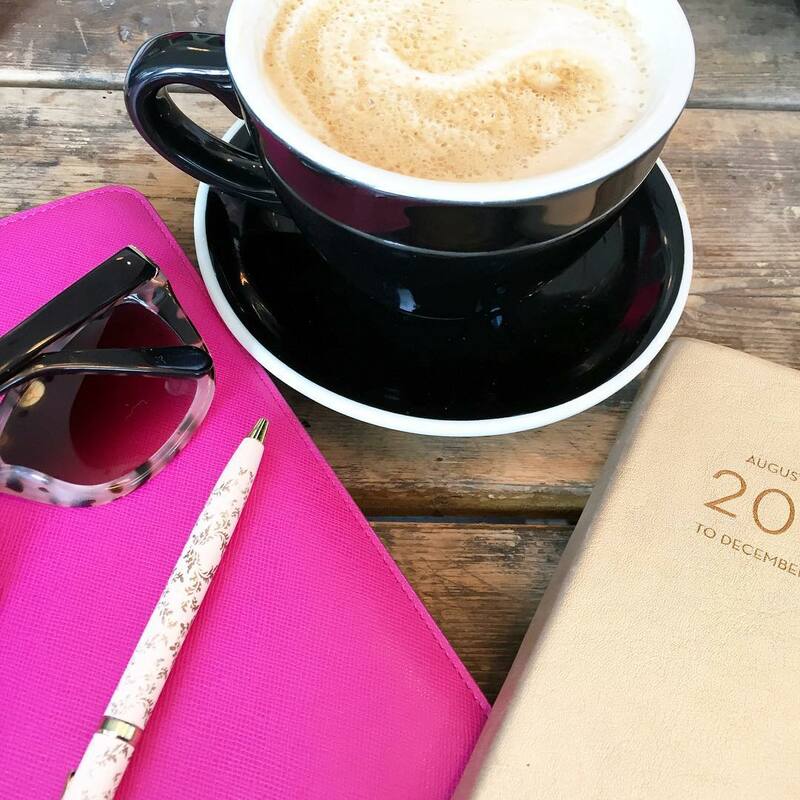 What I love about Minted's art section is that it's a chance for independent artists from around the world to have a place to showcase their art. How's this for a coincidence - the piece of art we ended up choosing was actually by a local artist out of South Boston - Joe Barka. You'll notice that the piece is actually vertical on the website but we thought it looked better horizontally above our bookshelves and that folks is the beauty of abstract art - no right or wrong way to hang it!! Have you ever purchased art online before? Do you like decorating or do you wish someone else would do it for you? I was provided a piece of art in exchange for my opinion. All opinions are 100% my own. I LOVE your office space and the art was the perfect piece to finish it off!!! Very classy with a modern twist!! I love it when they frame it for you to take all the guessing work out of which one looks best. Happy Tuesday my dear!! I like it horizontal too! Glad you guys found a piece of artwork that you both loved, and from a local artist? Super cool! oooh i totally think it looks better horizontal. i had no idea that minted allowed artists to sell their work, i guess it makes sense, silly me! what a coincidence that your art was from a guy near you. i really like it - dark but pretty colours! Minted is my jam! Love the art you chose. It fits perfectly in the space! Seriously Minted is like the Amazon of the world, taking over everything and doing it perfectly. Love that piece you picked out! it looks so good!! i may have to check out this site because our office needs some stuff!! It looks fabulous!!! I'm dying to buy a piece, but not ready to bit the bullet yet and do it... loving the shelving units too! you chose as AWESOME piece! i love how you hung it how it worked for y'all! minted has some of the best stuff-never disappointed with them. LOVE Minted, and the piece you selected is gorgeous!! The new art looks great - Minted is the best! I love your bookshelf/desk area too - I love that it's both! yay for supporting local artists! love that! 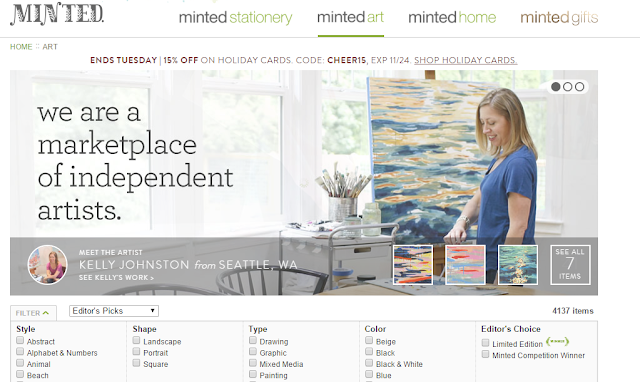 minted is now on my list of places to check out :) you picked a great piece! Our first piece of art was something we picked out during our honeymoon..we both loved it at first sight. We prefer picking up unique local pieces while we travel, but I bet minted is great if you're wanting pieces now. How cool is this this?! It looks amazing and perfect over your black shelves! I'll definitely have to check them out! I love Minted! While I was looking for my Christmas cards, I checked out their art and was so pleasantly surprised at the pieces they offer! Love the one you got! Looks great! I was just on teir website yesterday! And that chair... So good! I love this piece, such a great choice! Art is so fun to collect and use throughout your home! This looks like a really cool thing! I have used Minted for invitations and holiday cards but have not explored the art options. I didn't even know Minted has this stuff... I just thought they did holiday cards! How cool!! 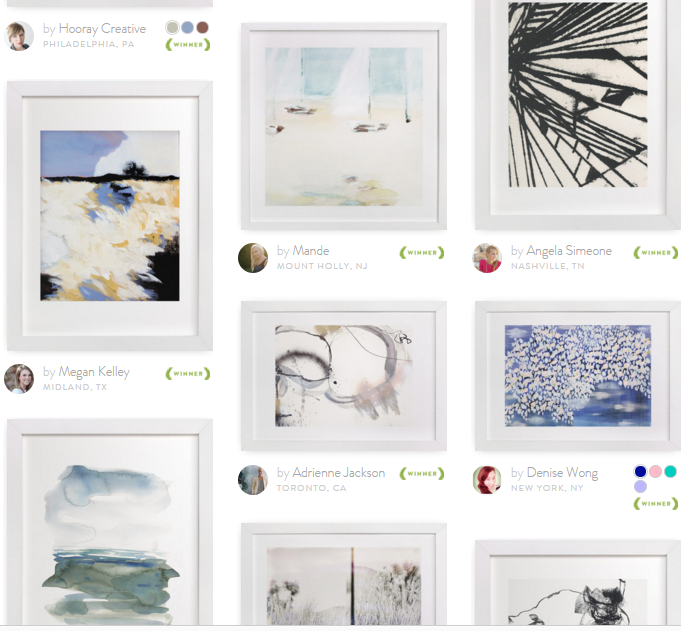 I actually just worked with Minted, too- they have some amazing pieces by new/independent artists at great prices! Love the piece you chose! What a great piece! I have been wanting to try Minted after hearing so many wonderful things. How amazing that the artist was from Boston?! Where have I been? Everyone is commenting how much the love Minted and I've never even heard of it!! That pieces of art looks great above the desk! I love that you can put it different ways, and definitely think it looks great with the space! Finding a local artist online is always sooo cool. I remember one time I found a design instructor giving all of these tips and things online and found out he used to teach at a nearby college but wasn't there anymore. I was a little disappointed because I wanted to learn more from him! I purchase a lot of art online! Nice choice for your space. I'm really loving Minted's art selection! I was looking at pieces for our nursery the other day. Really love the one you chose. I love Minted! I buy our Christmas cards from there every year, but have yet to purchase any art. I really like some of their stuff though, and I have a huge blank wall I'd love to turn into a gallery wall. I think they have some perfect pieces for that. Your space looks SO pretty (can I come work in there!?) and I love, love, love that piece you selected. Really interesting and definitely a great addition to the space! I love your chair!! That is so neat! And I love that you can choose your own frame, too, I didn't realize that! This is such a cool piece!!!! I like the colors in it and it goes well with your shelves which are totally cute! And that chair! That chair is amazing! Love that art piece! Since I am moving back home with my parents after I graduate in a few weeks, I am looking for decorate my room at home with some new art...I will totally have to check out Minted! Minted is my absolute favorite. We got our photo cards from them in the mail yesterday, and everything is such fantastic quality! We're the same way, we both have to love a piece before we put it up. Love your new piece! They have so many fun things! I love modern abstract art too. Yours is a great piece. Love your artsy and organized office area. Great shelving. Maybe I'm living under a rock, but I've never heard of Minted? (; Your space looks lovely! You can never go wrong with abstract! I haven't ordered from Minted before. Congrats on your new art piece. So cool that you ended up choosing a local artist! Love your ghost chair btw!!!! I love that you chose a local artist from Boston! Good call! We have no "art" in our home yet either! Decorating is always a challenge (especially with a spouse who contributes) - looks like you got a great wall art piece. I love decorating, but sometimes I just wish someone would do it for me! I feel like we run out of time on the weekends to hang stuff up and whatnot. The piece you picked out looks great in your office! Very chic piece! I can't wait to have an office in our next place to have some more room for decorating! Love the concept behind Minted! My daddy is an artist, so I was raised on fine art... it's one of my favorite things in the whole world. We have several different pieces in our house and my very favorite is a massive abstract piece that he did when I was a little girl. It is gorgeous! This looks fantastic in your office! I love your piece of art! Minted sounds awesome. I've never had luck shopping for artwork online but I like that you can customize everything so you can get the perfect size, colors, frame etc. The piece you picked out looks great in your office. Love the print and frame that you picked out - it looks great in that space! That print is perfect, and I am totally loving your shelf area too! It looks so clean and organized! Very cool! Looks great in your office! And how cool that the artist is from Boston?! Loove your office space girl and that piece of art you selected is gorgeous!! I love that you guys went different and hung it a different way than shown online, beauty of abstract art! Caleb and I have a very similar desk to yours! So cute!!!!! So pretty! I had no idea that Minted had an art section! The piece goes beautifully in your office! WOW! I really love that piece and the way you styled it. 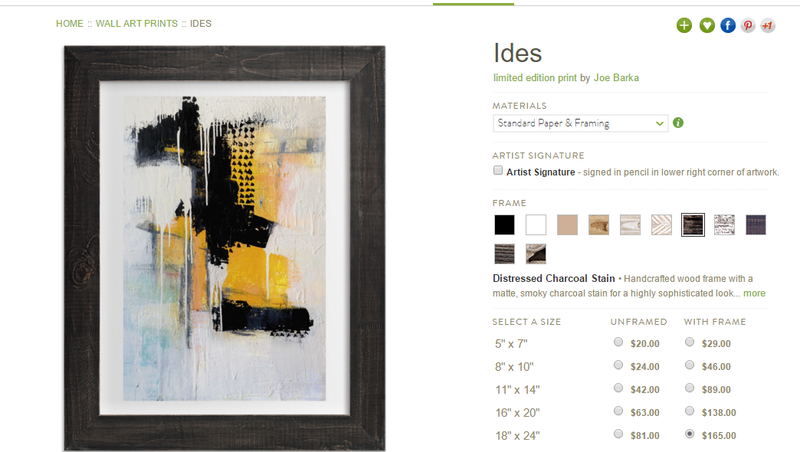 I didn't realize Minted had art...how cool! Beautiful piece and I like that you made it your own by switching the perspective. Minted has SUCH beautiful pieces on their website! I seriously don't know how I would ever be able to choose one. 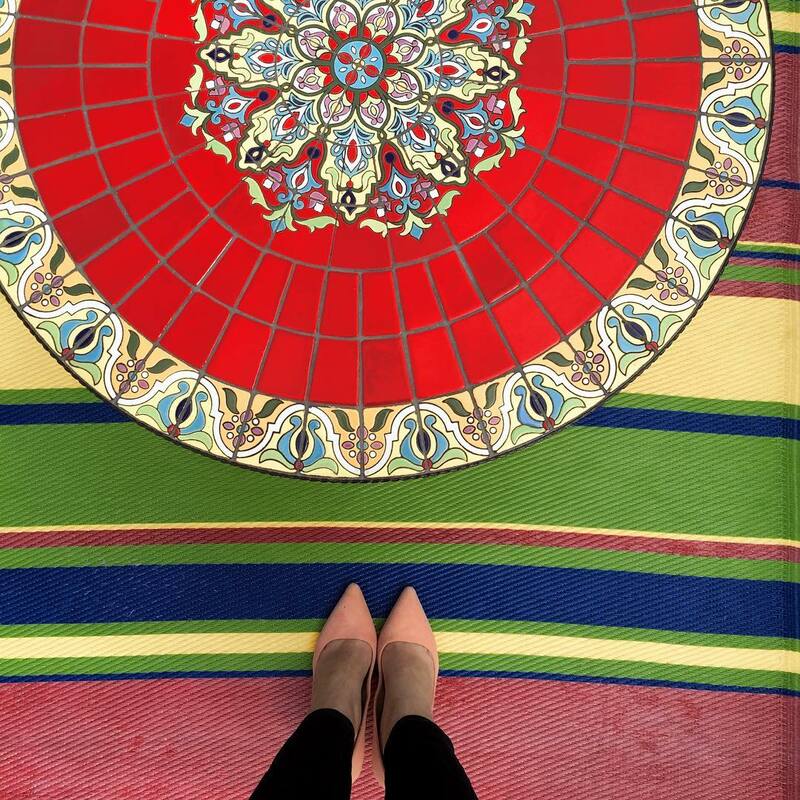 I love how you rotated it to fit your space! I loved Minted!! We get our holiday cards through them every year! I never knew they sold framed prints! This would make such a great gift! I love it!!! I love those shelves too! The art is the perfect addition!!! Nice shelves. Open space and it looks like you can keep a lot of items there. Useful. I like it! I feel because of your shelves it would have looked odd too. I really like your desk layout so clean and crisp. My desk looks like a mess usually. Ohh I love the print you picked out-- Minted has the cutest things, I'm sure you guys had such a hard time deciding!